What does Josh Hamilton's signing with the Angels mean? For the second straight year, the Los Angeles of Anaheim have reeled in the big kahuna of free agency and once again, seemingly out of nowhere. 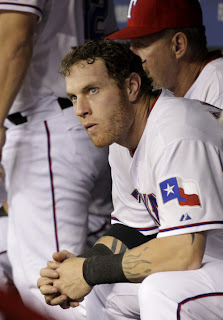 Outfielder Josh Hamilton has agreed to a five-year, $125 million contract with the club just hours ago. Here's my analysis. First off, who saw this coming? Then again, who saw the Angels swooping in a year ago to bring Albert Pujols and C.J. Wilson to Gene Autry Way. The owner Arte Moreno and the organization have shown a willingness to get aggressive and get into the mix for free agents that they were not thought to be contenders for. One of the reasons that the Angels were not really considering to be a real contender for Hamilton because they already were deep in the outfield even after Torii Hunter signed with the Detroit Tigers. Now with the addition of Hamilton, look for the club to try to move either Peter Bourjos or Mark Trumbo for some pitching and thus move Mike Trout to center. There is no question that Hamilton has one of the best bats in the major leagues, and some would say quite possibly the best. That should only make one of the elite offenses in baseball even stronger. But there are clear drawbacks when you give Hamilton a big contract. Hamilton comes with a history of injury troubles, as he has averaged about 129 games per season while playing Arlington, showing the effect that his prior troubles with drugs had on making his body more fragile. Also, you do have to worry about if he has another relapse, which he had a couple in Texas. But all in all, you are getting an elite bat still in his prime. What does this mean for Hamilton's now-former club in the Rangers? Texas is still in very good shape, even with Hamilton leaving town, and still boast a strong lineup. You do have to wonder if maybe the Rangers were getting closer to a potential move for Diamondbacks outfielder Justin Upton. Whether or not that happens, this is another salvo from California to Texas, showing that this rivalry will only get even more heated.